It seems like years since I last wrote – in fact it is I think! It is only two weeks before the August holidays. We get three weeks. I hope to get home a couple of times then. I might spend a week of the holidays at Futuna helping with retreats, but I don’t know yet. This term at varsity has been fairly busy. In English we were studying Shakespeare. We did 4 plays – “King Lear”, “Hamlet”, “The Winter’s Tale” and “The Tempest”. It was very interesting. In order to qualify for sitting the exam at the end of the year you have to write two essays and sit a term’s test. I got an ‘A’ pass for my first essay, which is 75% plus. I hope to finish the second essay by tomorrow, & the term’s test is on Tuesday. I’m not too worried about the test because I know the plays fairly well. Music is going very well too. For music analysis you don’t have an exam at the end of the year, but you write 4 essays during the year. I got an ‘A’ pass for my first one and I’m waiting to get another essay back. Then I’ve got to do another essay before the August holidays. Music Analysis is only 1/3 of a unit. We study music scores from 300 AD to 1750 AD. My first essay was on Machaut who lived in the 1300s. The second one was on Dufay, who lived 100 years after Machaut. The one I’ve got to do before August is on a Palestrina mass, & the 4th essay next term will be on Bach. Music History – which is worth 2/3rds of a unit – also doesn’t have an exam at the end of the year, but you pass on your year’s work. I’ve got 2 essays back – 78% for the first one, and 72% for the second one. I’m waiting to get another one back, and a fourth essay is due before the August holidays. It also deals with music between 300 AD – 1750 AD. You also have to do a largish project throughout the year. I’m doing mine on Plain Chant. So you see, I’m fairly confident about passing Music History and Analysis. Music Education is also going very well. It is worth a whole unit. We are now working in the Electronic Studio, and will begin to work there by ourselves this week. You have to write and record an electronic piece, which will be considered when they come to decide whether you should pass or not. Like the other music units, there is no final exam. Other things that contribute to a final result are an essay, weekly compositions, class participation, etc. I only got 55% for my essay – but it’s a pass; but have been doing very well for my weekly compositions and class participation. So I’m fairly confident about getting this unit too. The Electronic Studio is very complicated. There is a huge tape recorder there, plus 3 other smaller ones. 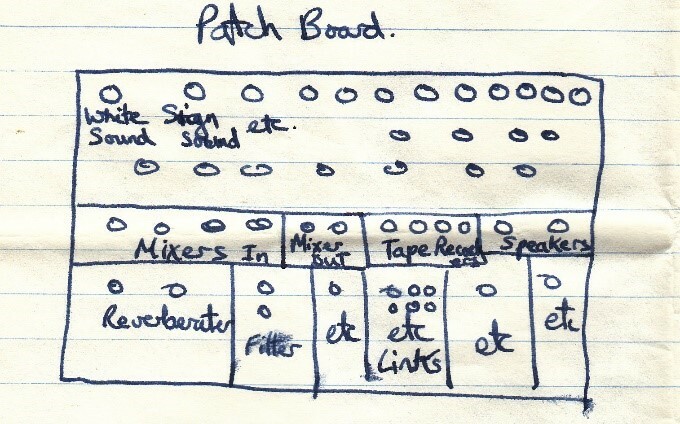 Then there is a patch board, where you plug various sounds in. You can make electronic sounds on it. etc., or sh sh sh sh. There are countless variations. If you connect the white sound to the reverberator it sounds like some is going shhhhh in a large empty room. Etc, etc, etc. As I said – it is very complicated. If you want to record any particular sound, then you just flick the tape recorder on, & it records automatically. You don’t have to stick to one sound at once either, but can make as many electronic sounds at once as you wish. For my electronic piece I’m going to do a hymn to Our Lady. The lecturer was very pleased with the idea. You can also take the tape recorder outside to record any other sounds that you can’t make electronically, e.g. traffic, birds singing, the sea, and so on. The idea of electronic music is not at all like the normal music you hear on the radio, but is just sound arranged in various ways higgle-de-piggle-de. It might, for example, sound like the noise you hear if you stop now and listen to all the racket that is going on about you. All of the newly ordained priests called here at some stage of the ten days they get after ordination. They are a very busy 10 days, because by the time they’ve visited their old schools and various convents and people they should visit the 10 days are over. At present at the Mount they are out at Waimarama for Mid-winter Camp. Robert Devlin & John Worthington (an Australia) will be down here observer teaching at St. Pats. Remember last year I went to Hastings’ Boys High. Brendan Smith went to Hospital yesterday with an abscess on his appendix. They don’t have to operate, but he’s got to take antibiotics. I had a medical check up last week & am very well. Everyone at Varsity gets a medical check up once a year. We had study fortnight a month ago. Some had exams, but I didn’t. Tim Donoghue – who left during Highden – finished his B.A. during Study Break. John Kavanagh will finish his B.A. this year. Well, I think that that’s all the news. Just remembered… 4 of us will be going up to Marycrest from time to time to play table tennis & have a meal with the girls. The nuns asked Fr. Roach. So we might be going up and stay the night. Two would stay in the chaplain’s House, and the other 2 would stay at home – if that is alright. Anyway, I’ll let you know when; nothing is finalized yet.